The YUI Layout Manager allows you to create cross-browser, pixel-perfect application layouts with little effort. 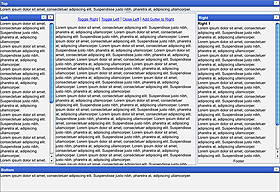 Layout Manager establishes structured layouts containing top, bottom, left, right and center layout units. Units can be resized or collapsed by the user; properties and contents of layout units can be modifed scriptologically through an extensive API. Layout Manager can establish a new layout either at the body-element level (taking up the full viewport) or within a single element (such as within a Panel). Examples: Explore examples of the Layout Manager in action. API Documentation: View the full API documentation for the Layout Manager. Release Notes: Detailed change log for the Layout Manager. Download: Download the Layout Manager as part of the full YUI Library at YUILibrary.com. There are 2 different types of layouts supported by the Layout Manager: full page and element-based. A full page layout will take over the entire screen and fill up all available space. View a full page example. An element-based layout will take over the entire area of a given element on the page (like a panel or DIV). View an element-based example. Each layout is comprised of 1 to 5 Layout Units, each having is own set of configuration options. These units are then given a position inside the layout of: Top, Right, Bottom, Left or Center. There can be only one Layout Unit per position; Layout Manager will not let you add a unit to a position if it has already been filled. 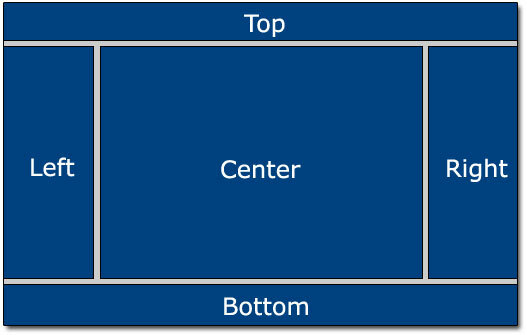 The only required Layout Unit is the one at the center position. The center unit is the fluid unit, it should not have a height or width assigned to it as it will automatically be calculated based on the sizes of the other units and the space available for the layout. It also cannot be resizable, the other units are responsible for this setting. Below is a wireframe showing the various positions of the layout. Download this PDF file for a more detailed view. Layout units are the individual areas inside of the main layout. Each unit is comprised of a modified version of the "Standard Module Format". The difference is that their CSS classnames have a yui-layout prefix. Each Layout Unit has the ability to be added and removed after the layout has been rendered. They are also highly customizable through the various configuration options. See the API docs for a complete list. Setting up a full page layout is as simple as passing in the config for the layout, if no element is passed as the first parameter the Layout Manager will assume that we are going to take the whole screen. Each area of the layout (top, right, bottom, left and center) are made up of LayoutUnit's. The only required unit is the center unit. It will be the one that is fluid when styled. We can setup these units by passing them into the unit array configuration option. position: The position that this unit will take in the Layout. header: The string to use for the Header of the unit. width: The width (in pixels) that the unit will take up in the layout (only applies to left and right units and is required). height: The height (in pixels) that the unit will take up in the layout (only applies to top and bottom units and is required). resize: Boolean indicating whether this unit is resizeable. gutter: The gutter applied to the unit's wrapper, before the content. footer: An id or string to use as the footer of the unit. collapse: Boolean indicating whether this unit is collapsible (if true, places an icon in the header). scroll: Boolean indicating whether the unit's body should have scroll bars if the body content is larger than the display area. animate: Boolean indicating whether the expand and collapse transitions should be animated; if true, requires the Animation Utility. See the API docs for more info on LayoutUnit options. .yui-layout Applied to the element that is the root of the layout. .yui-layout-doc Applied to the first wrapper around the layout. .yui-layout-unit Applied to root element of each layout unit. .yui-layout-unit-left Applied to the root element of the left unit. .yui-layout-unit-right Applied to the root element of the right unit. .yui-layout-unit-top Applied to the root element of the top unit. .yui-layout-unit-bottom Applied to the root element of the bottom unit. .yui-layout-unit-center Applied to the root element of the center unit. .yui-layout-wrap Applied to the wrapper around the Standard Module Format elements inside the root element. .yui-layout-scroll Applied to the root element of the unit when the config option scroll is set to true. .yui-layout-hd Applied to the header element of the unit. .yui-layout-bd Applied to the body element of the unit. .yui-layout-bd-nohd Applied to the body element of the unit if there is no header present. .yui-layout-bd-noft Applied to the body element of the unit if there is no footer elemen present. .yui-layout-ft Applied to the footer element of the unit. .yui-resize* If the unit is resizable, the Resize Utility's classes will be applied to the root element. The Layout Manager comes with a default presentation or "skin," part of the "Sam Skin" visual treatment that accompanies most YUI controls. You can read more about the general approach to skinning YUI components in this in-depth article. The CSS provided with the Layout Manager is comprised of core, functional CSS as well as the Sam Skin visual treatment. To explore the CSS which controls the Layout Manager's presentation, please review the Layout Manager's Skinning Example wherein the full CSS for the control is displayed. The Layout Manager is not officially supported on a mobile device. Mobile devices tend to not report browser resize events properly or screen size properly. These events and properties are what the Layout Manager uses to make it's calculations. So if they are incorrect then the layout will render incorrectly.